Still on the Niobrara Valley Preserve theme today, but not really strongly fire-related this time. Leaf cutter bee (Megachile sp.) on plains sunflower (Helianthus petiolarus). The Nature Conservancy’s Niobrara Valley Preserve, Nebraska. Click on the photo for a sharper look at it. No, this isn’t some voracious predator waiting to ambush some hapless pollinator insect…it IS a pollinator insect. More specifically, it’s a female leaf cutter bee. I found her hanging out on an annual sunflower blossum in the early morning. I’m not sure if she was warming up or resting or both? Thanks to Mike Arduser for identifying the bee. He guessed that it’s probably Megachile fortis – a specialist pollinator on sunflowers. 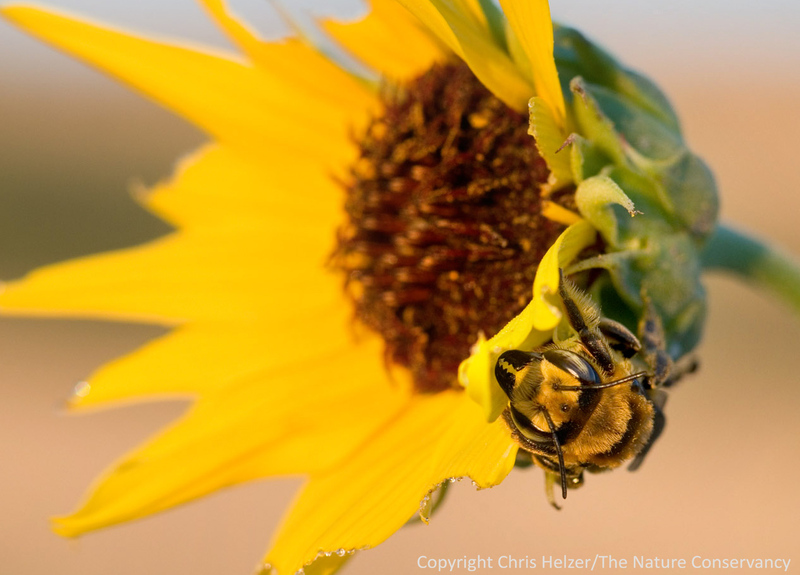 This entry was posted in Prairie Insects, Prairie Photography and tagged close-up photo, insect photo, leaf cutter bee, nature photograph, niobrara valley preserve, pollinators, sunflower by Chris Helzer. Bookmark the permalink. My what large mandibles you have!! I’m glad you said to click on the photo. I have a number of bees, and will watch for those mandibles to see if some of mine are like this one. I frequently see bees resting, or maybe sleeping on my plants. Oh, and I’m also glad I scrolled down to see that the green bee is a sweat bee. I saw one on my cup plant bloom the other day, and have seen them on other flowers from time to time.